Albany, NY – Mayor Jennings today officially cut the ribbon on the newest building on New Scotland Avenue. He was joined by James J. Barba, president and CEO of Albany Medical Center; Michael J. Castellana, president and CEO of SEFCU; and officials from Columbia Development, Capitalize Albany Corporation, CVS, the City of Albany, and Empire State Development to celebrate this important new addition to the New Scotland corridor. The building unofficially opened three months ago with medical offices of Albany Medical Center’s Department of Obstetrics & Gynecology on the second floor. Work continued on the third floor, which is now occupied by the physician assistant and nurse anesthesiology training programs of the Albany Medical College, and street level spaces that house CVS and SEFCU. Work is now complete on this project that began more than three years ago. 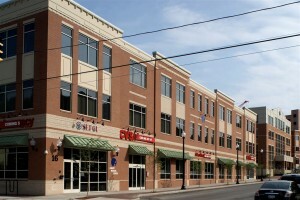 In 2007, the Capitalize Albany Corporation assembled 20 individual properties along New Scotland Avenue with the plan of spurring redevelopment along that commercial corridor. The City of Albany partnered with the Capitalize Albany Corporation and Columbia Development Companies on this project to apply for a $3.3 million Restore NY grant from Empire State Development (ESD). The Restore NY program is designed to revitalize distressed urban communities that are experiencing vacancy and blight. Once awarded, the funding off-set demolition and site development costs in order to make this project possible. Today the site offers tremendous new services to the community including a pharmacy, a first-ever neighborhood branch of SEFCU, and upper floor medical and educational facilities. The 55,000 square foot building cost more than $17 million to construct. Columbia Development acquired the assembled site and was the project developer. They were able to complete the building ahead of schedule and paid careful attention to details that complemented the surrounding neighborhood design. 16 New Scotland is the most recent in a long line of projects on which the City of Albany, Albany Medical Center and Columbia Development Companies have partnered. Completed projects include the Physicians Pavilion, Hilton Garden Inn at Albany Med, and office buildings at 22, and now 16 New Scotland Avenue. These projects blend the practical needs of the community with the business needs of AMC. Even with all of the projects completed over the last several years, there are still more projects in the pipeline for this area. A new 1500-space parking garage for Albany Medical Center is currently under construction at 40 New Scotland Ave, and right in front of the new parking garage at 50 New Scotland work has begun on a new retail/office building, which will include a Panera Bread. The centerpiece of Albany Med’s revitalization effort is a $360 million, six six-story Patient Pavilion, which is currently under construction. The new Patient Pavilion will be constructed at the east end of the campus. Expected to be completed in 2013, it will include expanded adult and neonatal intensive care units as well as new operating rooms and recovery rooms. The project will add 1,000 new permanent jobs and 800 temporary construction jobs.